For many years, I was one who thrived on multitude. If I loved a piece of clothing, I’d buy it in every color, sometimes even in multiple sizes (because hello, my weight fluctuates), and store it for what seemed like years. If Target had a 70% off clearance section, I would ravenously explore it and leave with half the inventory, because it was on sale. I’ve tried to analyze the reasons why I was likely to do so, and have realized that for some time, my income was so limited (thanks, grad school, postdoc, and daycare tuition!! ), that when something went on sale, I felt like I had to have it, and as I mentioned, sometimes in multiples. I would also keep every single I owned for years, largely because I wasn’t sure whether I would be able to buy something to replace it later. Thus, clutter ensued. As time went on, I had kids, life got busier, and the enormous quantity of stuff that I owed became overwhelming. It caused chaos, lack of organization, and truly, became a source of anxiety. Over the course of the past two years, I have slowly purged many of the rooms in our small-ish house. The purge was largely driven by our kitchen remodel and the need to displace kitchen items for storage in other places throughout the house. When those spaces were limited, I began to purge. Today, a large majority of our house has been purged and streamlined. I recently worked on a closet that was overflowing and thanks to the magic of ziplock storage bags, is now a functional closet with space for guests. This past weekend, I took 5 large bags (think blue, Ikea large bags) to consign. Several items were accepted, so I am now $200 richer and the owner of 40 or so fewer items. My last project focused on the kids’ room, and their room too, is now a bit more organized thanks to the magic of Closetmaid and their cube-organizers! 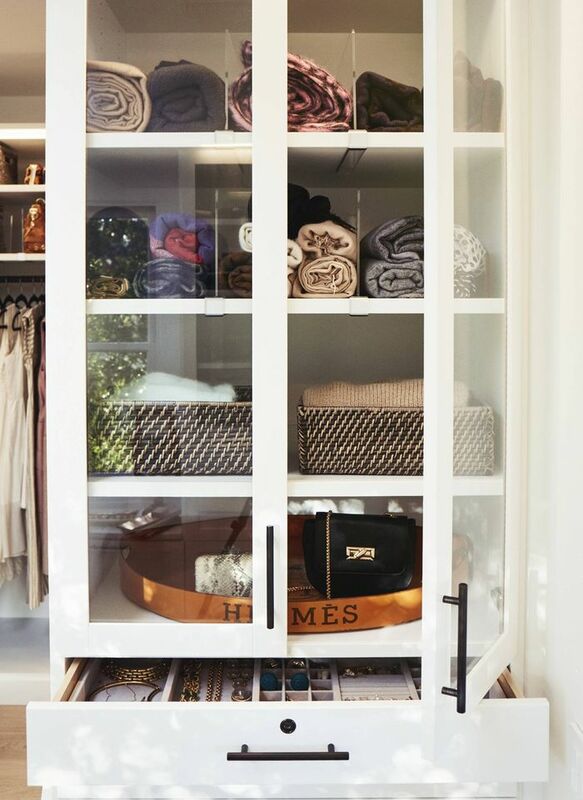 While this ultimately requires a more monochromatic wardrobe, not achievable in my life, what I love about it is the seemingly sparseness of items, the uniformity in use of hangers, and ultimately, the way the items are staged, such that the characteristics that generate “joy” – to quote Marie Kondo of The Magic Art of Tidying Up – are highlighted and featured prominently. I plan to give myself until the end of the year to accomplish the editing of all four rooms, but am excited to get started! Do you have any streamlining/editing projects you’re currently working on? If so, what are some strategies you are using to implement the process? Looking for any tips or suggestions as I start these next projects! I love to host. Parties, birthdays, you name it. I love the detail that goes into the preparation, but most of all, I really enjoy the set up and decorating. I’ve always wanted to throw a dinner party with a true tablescape and decor so a Galentine’s Day celebration was the perfect excuse. Once the menu was planned, it was time to get to the other details: decor! My friend Heather of My Life Well Loved has an amazing friend, Sara of Gold Leaf Floral who provided floral arrangements for our bash. They arrangements were AMAZING. Can I also mention that the floral arrangements lasted DAYS after the dinner party??! And, they were oh, so fragrant!! She’s really so super talented! Sarah graciously connected me with Ginger of Swan Lindsey Lettering, who made the cutest oragami name cards to complete the place setting decor. I gave her the names of everyone who was going to be attendance and we all shared a Pinterest board and off each went to create magic! The name cards were the cutest! Sometime before Christmas, I purchased wood chargers because I was hopeful that our kitchen remodel would be done and I would be able to use them for Christmas or NYE. Sadly, they sat unused as our kitchen remodel is just now on the verge of being complete (we are about 99.8% done now, with just a few minor details left to complete), and it occurred to me that they would be perfect for this Galentine’s Day dinner. I used china that I owned, my own utensils, a crochet runner that my mom made and gifted me when I bought my house in AL, and a heart garland I found in the Dollar Spot at Target. Target is also the place where I found a tassel garland that I hung over backs of the two chairs you see when you walk in the room. Oh yeah, I also had votives from long ago that I often use during Christmas time, so I pulled those out and put in a candle in each to add a bit of romantic flare to the table. Two blush pink mercury vases added the final touch to the tablescape! The two vases were also from the Dollar Spot at Target. At some point during the dinner, I knew we were going to want to toast, so I pulled out some plastic champagne flutes that I keep for New Year’s toasts, bought some heart shaped Peeps, and red and white straws, and dressed up the pink moscato champagne I had chilling in the fridge for our Galentine’s Day toast! Last but not least, my friend Brittany of Southern Mama Guide joined us for dinner and since she and I were both going to have littles around, we agreed to have a good friend of mine who often babysits for me, keep all the littles in the basement while the mama’s dined and wined upstairs. It worked perfectly and Shira if you’re reading this, we were so grateful!! Brittany has a great post sharing a fun Valentine’s Day outfit if you still need ideas for an outfit of the night! Oh, one other thing: I thought it would be super fun to have “swag bags” for my friends to take with them when they left, so I am beyond thankful to Fabrik in Homewood, AL who provided the CUTEST parting gifts for my guests! I was honestly amazed at how well it came together. I was super nervous about it all, but so grateful to all these women who helped make it a success! I’ve linked all of their blogs and websites throughout the post, so be sure to click and visit each of their pages and follow them along on social media. They are each amazingly talented entrepreneur mama’s! So there you have it! My low-key, low-expense way to throw a Galentine’s Day party together. What are your plans for Valentine’s Day or Galentine’s Day?? Check out my last post for a fun accessory idea for the big day!